Description: Sexes similar. Long,slender bird. Grayish-brown above, grayish-white below. Rather long, curved bill is all black; but some birds may have a yellow spot on the base of the lower mandible. 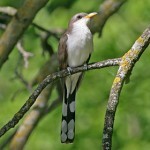 Primaries are uniformly brown, compared to the rufous primaries of the Yellow-billed Cuckoo. Reddish eyering. 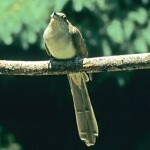 Undertail feathers are gray with white tips. 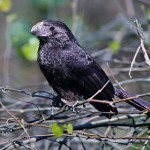 Juvenile is similar but with buffy eyering; paler undertail with less contrasting white spots; and underparts may show a buffy tinge. 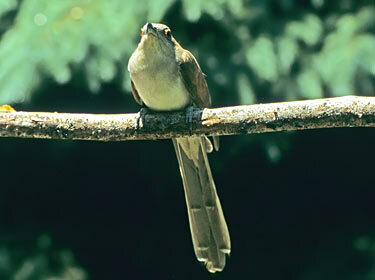 Behavior: Cuckoos are generally quiet, shy birds and usually remain concealed in vegetation. Also breeds in Nebraska. Habitat: Usually found in dense wooded habitats, especially those with a variety of trees, bushes and vines for nesting sites. Where in Nebraska: Uncommon to common spring and fall migrant and summer resident across the state. Most common in the northeast, and rarer in the south and west.